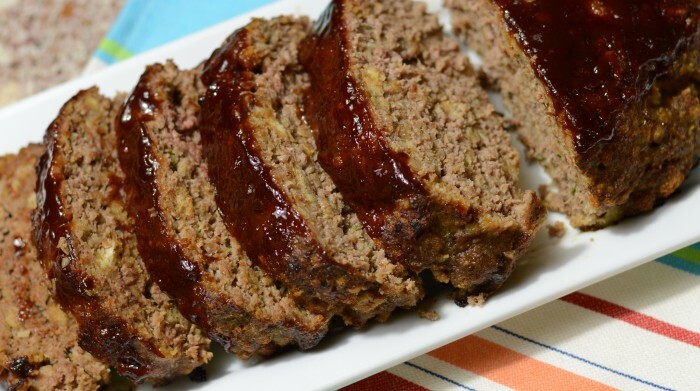 Stove Top Stuffing Meatloaf–& Meatballs! Years ago while thumbing through a magazine, I came across a meatball recipe made with Stove Top stuffing, and I was immediately intrigued. Now, those of you who know me will probably recall that there are no better meatballs that can be made than those of my beloved Italian grandmother’s. None. But her recipe is a big one, calling for 4 lbs of ground beef and a slew of other ingredients, all of which contribute to the absolute awesomeness of those little balls. But these are great in a pinch. Really great. They’re so fast and with the herbs already in the stuffing, honestly, they’re the next best thing to my Grandma’s. Lo and behold, while I was getting ready to make these meatballs, I came across the meatloaf recipe on the back of the stuffing box. It was almost the same as the meatballs, so I made the meatloaf instead. Since I’d never had meatloaf with BBQ sauce as the recipe suggested, I used that. But by all means, substitute ketchup if you prefer. Today, I’m doing double-duty–I’m including the recipes for both meatloaf and meatballs! Place beef, stuffing mix, water, eggs, and 1/4 cup of BBQ sauce in large bowl. Shape into loaf in 13x9 pan. Top with remaining BBQ sauce. Bake 1 hour or until done (160 degrees). Line 2 - 15x10x1 pans with foil. Spray with cooking spray. Shape into 32 balls, using 1/4 cup of beef mixture each. Place 16 meatballs onto prepared pan. Bake 16 - 18 minutes. One Response to Stove Top Stuffing Meatloaf–& Meatballs!